On any given Friday or Saturday night, the Concordia Stingers men’s hockey team is usually playing a game at the Ed Meagher Arena. On this particular Friday night, the Stingers are playing the Western Mustangs. They may not be the best team in the league, but the Stingers know they have to play well if they want to win and get those crucial points for the standings. Meanwhile, up in the press box are Salim Valji and Andrew Barlett. Both men are broadcasters for the Concordia Stingers basketball and hockey webcasts. Valji does play-by-play, while Barlett does the colour commentary. Up in the box, Valji and Barlett strike up a conversation with a couple of Stingers, who approach Barlett and shake his hand. He smiles, makes a couple of jokes and then turns back to Valji for some notes. The men who approached Barlett are not just Stingers at the game, they are also his teammates out on the football field. 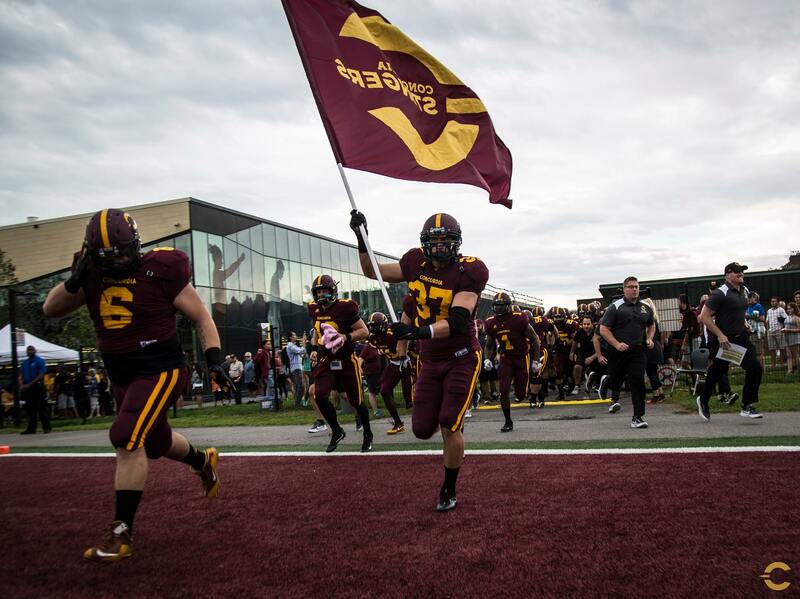 Barlett is not just a broadcaster—he is first and foremost a defensive end and captain of the Concordia Stingers football team. Born and raised in Burlington, Ont., sports have always been a part of Barlett’s life. His father won a Vanier Cup with the Acadia Axemen in 1979. With a desire to follow in his father’s footsteps, Barlett took up football and hockey. With a bigger passion for football, Barlett eventually decided to ditch hockey and went through the recruitment process for university in his last year of high school. Despite calling Concordia his home for the last five years, Barlett never thought he would wind up in Quebec. After winning the Ontario championships with his high school team, a few coaches from Concordia approached Barlett and offered him a spot on the team. From that point on, the coaches stayed in contact with him and Barlett came to Montreal for a recruiting trip. Barlett, who is studying human relations, immediately took a shine to Concordia and has done almost everything he can to stay involved in the school. Last year, he was the vice-president of finance for the department of applied human science, and the year before, he was the vice-president of academics for the same department. Furthermore, Barlett is a part of two charities on campus, as well as Concordia’s SWARM, which aims to get more people to attend Stingers games. He has even earned the nickname “Mr. Concordia,” thanks to his pride in the university. Barlett (left) and Valji (right) have been broadcast partners for three years. Photo courtesy of Andrew Barlett. When it comes to broadcasting, Barlett has been a part of the Stingers webcast for three years now. After working on the webcast in a supporting role, Barlett figured he would give being a broadcaster a shot. Some inspiration from a few former teammates helped guide his decision as well. Valji and Barlett have been partners for the last three years. They linked up with one another when Valji started his first year of journalism at Concordia. Valji, who had an interest in broadcast journalism, signed on to be part of the Stingers webcast. For the first year of their partnership, Valji and Barlett only called men’s hockey together. Over the last two years, however, they have been doing basketball and hockey together for the men’s and women’s teams. According to Valji, working with Barlett has been fun because they both have laid-back personalities. Valji said they are always trying to make their audience laugh and, over time, they have been able to develop great chemistry. As Valji and Barlett prepare their notes with just five minutes until the broadcast, a Stingers employee taps both men on the shoulder and hands them each a headset for the game. Barlett and Valji adjust their ties almost in unison and then turn around to face the camera. They’re live.